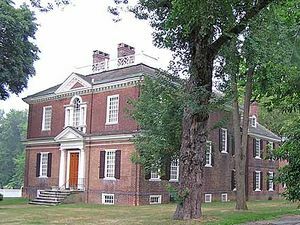 In 1756-58 William Coleman, a Philadelphia merchant and close friend of Benjamin Franklin, built this elegant country home. Woodford — a National Historic Landmark — is one of the most handsome survivors of the early "summer retreats" that were built along the Schuylkill River during the eighteenth and early nineteenth century. Today, Woodford is owned by the City of Philadelphia and operated by the Naomi Wood Trust as an historic house museum. The house is furnished with an extraordinary collection of 18th and early 19th century antiques and decorative arts begun by Naomi Wood, a Philadelphia-born collector. Woodford is open to the public year round. Note: The above descriptive information came from the museum's home page. This page was last edited on 4 April 2019, at 16:00.